Manish Sudesh, B., Prafulla Balkrishna, C., Bhanudas, I. (2010). Multiple Linear Regression Study of 2,4-Disubstituted 1,5-Benzodiazepine as Potential Antiinfectives. Iranian Journal of Pharmaceutical Sciences, 6(3), 199-208. Bhatia Manish Sudesh; Choudhari Prafulla Balkrishna; Ingale Kundan Bhanudas. "Multiple Linear Regression Study of 2,4-Disubstituted 1,5-Benzodiazepine as Potential Antiinfectives". 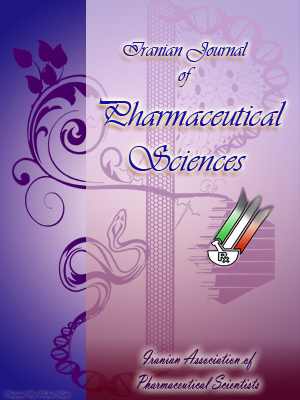 Iranian Journal of Pharmaceutical Sciences, 6, 3, 2010, 199-208. Manish Sudesh, B., Prafulla Balkrishna, C., Bhanudas, I. (2010). 'Multiple Linear Regression Study of 2,4-Disubstituted 1,5-Benzodiazepine as Potential Antiinfectives', Iranian Journal of Pharmaceutical Sciences, 6(3), pp. 199-208. Manish Sudesh, B., Prafulla Balkrishna, C., Bhanudas, I. Multiple Linear Regression Study of 2,4-Disubstituted 1,5-Benzodiazepine as Potential Antiinfectives. Iranian Journal of Pharmaceutical Sciences, 2010; 6(3): 199-208. This paper describes 3D-QSAR analysis and biological evaluation of 1,5-benzodiazepine analogues. Benzodiazepine nucleus with its simple structure gives a good opportunity for further modification regarding an increase of its antimicrobial activity. We synthesized a series of benzodiazepine analogues from condensation of various chalcones and halo substituted o-phenelynene diamines. All compounds were assayed in vitro against, E. coli, P. aeruginosa, S. aureus. The models were generated on the Vlife MDS 3.5; selected models showed a correlation coefficient (r2) above 0.9 with cross-validated correlation coefficient (q2) above 0.8, respectively, for all the selected organisms. The 3D-QSAR models generated were externally validated for all models using a test set of 6 molecules for which the predictive r2 (r2-pred) was found to be above 0.45. The results of 3D-QSAR indicate that contours can be used to design some potent antibacterial agents. Diazepine ring is the backbone of several antibacterial [1-6], antileishmanial  anti-fungal , and anti-inflammatory  agents. Considering the scope for further studies on diazepine derivatives we have synthesized some new 2,4-disubstituted -1, 5-benzodiazepine derivatives and screened them for antimicrobial activity. The process of pharmaceutical drug design usually begins the discovery of a lead molecules and followed by its optimization which include its synthesis and testing of thousands of derivatives of the lead structure in order to find out the cilinically usefull drug. Computational methodologics have grown rapidly over the past few years and played an important role in the development of a number of drugs available in the market or undergoing clinical trials. Scientists have used quantitative structure-activity relationships (QSAR) models to predict the activity of new molecules. In the recent past, some efforts have been made to understand three-dimensional quantitative structure-activity relationships (3D QSAR) with respect to antibacterial agents. In the present study,report 3D QSAR studies on several novel 2,4-disubstituted benzodiazepine derivatives and a correlation to predict the antibacterial activities with high degree of reliability. We performed QSAR studies to relate the minimum inhibitory concentration (MIC) required to inhibit growth of E. coli (NCIM27350), S. aureus (NCIM01065), P. aeruginosa (NCIM501), with the 3D QSAR descriptors. The QSAR model was developed using multiple linear regression (MLR) and validated using an external test set of compounds. stretching); 2980.21 (CH-stretching); 1413 (C=N deformation); 790 (C-Cl deformation). The IR (KBR) spectra of the synthesized compounds were recorded on a Jasco- FTIR 4100 instrument. The 1H NMR spectra of the compounds were recorded on 400 MHz Varian NMR, using DMSO as solvent. This series was subjected to QSAR studies using V life MDS 3.5 running on P-IV processor. Table 1. Substitution of the 2,4-disubstituted-1,5- benzodiazepine derivatives. Figure 1. The alignment of all synthesised molecules. All of the compounds were screened for antibacterial activity against E. coli (NCIM27350), S. aureus (NCIM01065), and P. aeruginosa (NCIM501) by serial dilution method. Ciprofloxacin used as standard drugs for antibacterial activity. Test solutions at the concentrations of 1000, 750, 500, 250, 125, 62, 31.5 μg/ml were added to the respective cavity aseptically and labeled accordingly. Standard was added in concentration of 100 mg/ml. The plates were kept undisturbed for at least 2 h at room temperature to allow diffusion of the solution properly in the nutrient agar medium. After incubation of the plates at 37±1 °C for 24 h, the minimum inhibitory concentration was determined. The molecules of the dataset were aligned by the atom -fit technique, using atoms common with the structure of benzodiazepine. The most active molecule was selected as a template for alignment of the molecules. The alignment of all the molecules on the template is shown in Figure 1. Like many 3D QSAR methods, a suitable alignment of given set of molecules was performed using the Vlife MDS 3.5 Engine . The dataset was divided into a training set and a test set molecules on the basis of chemical and biological diversity using the random selection method for generation of the training and test set data. The molar inhibitory concentration (pMIC) values for antifungal activity were used for the present 3D-QSAR study. The molecules which are selected for QSAR analysis are shown in Table 1. A relationship between independent and dependent variables (3D fields and biological activities, respectively) were determined statistically using regression analysis. Linear regression is achieved by fitting a best-fit straight line to the data using the least squares method. The quality of fit for a regression equation was assessed relative to its correlation coefficient and standard deviation. The F value represents the level of statistical significance of the regression. Quality of selected models was further ascertained to select the best model from cross-validated squared correlation coefficient (q2). To systematically assess a QSAR model, a reliable validation is required. Usually, a QSAR model is evaluated by the predictive results for the given dataset. Selected models having r 2 above 0.7 were checked for their external predictivity. The observed and the predicted values for antibacterial activity are shown in Table 3. Scheme 1. Reaction for the synthesis of 1,5-benzodiazepines. Figure 3. Correlation plot of observed vs predicted activity for model A. The 2,4-disubstituted-1,5-benzodiazepine were prepared by condensation of chalcones with halo substituted o-phenylenediamine (OPA) (scheme-I, table1). The first step was synthesis of various substituted chalcones as per reported procedure, the synthesized chalcones were confirmed by physicochem-ical analysis. In the second step, carbonyl group of chacones was reacted with halo substituted OPA in presence of glacial acetic acid to form 2,4-disubstituted -1,5-benzodiazepine. NMR data of the 2,4-disubstituted- 1,5-benzodiazepine derivatives is shown in Table 2. The use of microwave irraditation augmented the yield of the reaction upto 93-95% and also led to decrease in reaction time to about 10 min. Results of Infrared and NMR analysis confirmed formation of the desired product. IR spectrum of the compounds showed peaks in the region 3070-3220 cm-1 (N -H stretching), 1645-1655 cm-1 (C=N) as diagnostic absorptions. The NMR spectrum showed NH peak between 3.6-4.2 ppm indicated cyclization to form diazepine ring. For the current QSAR study, 24 molecules were used in the training set (Table 1), with the number of field grid points being not more than four per model. To evaluate the predictive ability of generated 3D-QSAR models, a test set of six molecules with regularly distributed biological activities was used. A prerequisite for QSAR study is a congeneric series of molecules, all having the same mechanistic profiles with similar functional properties. Congenericity is a challenging task to define, though it is well-documented that all molecules in a set should have the same molecular framework with structural variation in one or several positions. On successful runs of MLS, different sets of equations were generated by keeping the chain length of equations to four, and these equations were further analyzed statistically to select the best model. As shown in Table 4, two models were selected after screening various combination of different descriptors. Figure 4. The field points for model B. Figure 5. Correlation plot of observed vs predicted activity for model B. Figure 6. The field points for model C.
The model A describes the structural features optimum for the antibacterial activity against S. aureus. The steric and electrostatic fields were calculated using the Merck Molecular Force Field and Gasteiger-Marsili charges. The model was selected on basis of r2, q2, pred r2 and F values. The r2 value for model A was 0.9032, q2 was 0.8116 and the external predictivity of model A is found to be 0.5134. The points selected for the QSAR equations are shown in Figure 3. The contribution of points E-552 (electrostatic interaction field, Blue points) and S-540 and S-415 (steric interaction field, green points) at lattice points 552, 540 and 415 along with points H-502 (hydrophilic interaction field, yellow points) at lattice point 502, imply that these points are needed to be considered for the structure-activity relationship. The negative contribution of the fields point indicates that the addition of groups having lower steric interaction at lattice point 540 and 415 (green point in Figure 2) and groups having electrostatic interactions at lattice points 552 (blue point in Figure 2) are required for amplified activity against S. aureus. Along with this the fields H-502 which contribute negatively to the activity also need to be taken into account. The hydrophilic interactions at lattice point 502 (yellow point in Figure 2) needs to be reduced. The substitutions on the phenyl ring of the benzodiazepine ring should show less steric and hydrophobic interactions to show a better activity against S. aureus. Figure 7. Correlation plot of observed vs predicted activity for model C.
The model B describes antibacterial activity against P. aeruginosa. The r2 value for model B was 0.9455. The points that were found optimum for the activity after the QSAR study are shown in Figure 4. The contribution of points S-743 which is steric and E-312, E-469, E-334 which are electrostatic interaction fields (green and blue points, respectively), imply that these points are indeed significant for the structure-activity relationship. The positive contribution of the fields E-469 and E-334 and S-743 indicates that the addition of groups having electrostatic interaction at lattice point 469 and 334 (blue point in Figure 4) and 742 (green point in Figure 4) are required for amplified activity against P. aeruginosa. Along with this the fields E-312 which contribute negatively to the activity also need to be taken into account. Thus increasing the groups with electrostatic interactions on the phenyl ring of benzodiazepine will lead to better actvity. While some groups with steric interactions at the phenyl ring on second position of the diazepine ring should augment activity. The model C describes the properties required for the activity against E. coli. The r2 value for this model C was 0.9834. The F test value was found to be 108.51 which is considered for the selection of model. The points that were found optimum for the activity after the QSAR study are shown in Figure 6, S-482, S-371 and S-460 which are the steric interaction fields and along with H-388 which is the hydrophobic interaction field (yellow point) at lattice point 388, imply that these points are important for the structure-activity relationship. The positive contribution of the fields S-482, S-371 and S-460 indicates that the addition of groups having steric interaction (green point in figure 6) are required for amplified activity against E. coli. Whereas the field H-388 which contribute negatively to the activity should be decreased to augment the activity. Table 2. Characterization data of synthesised compounds. N=CH), 116.8-139.01 (m, Ar-C), 20.9 (s, Ar-4-CH3). 162.16 (d, N=CH), 121.08-139.97 (m, Ar-C). N=CH), 117.94 142.67 (m, Ar-C). N=CH), 112.88-142.70 (m, Ar) 159..80 (s, CH-OH). NHCH=CH), 166.91 (d, N=CH), 119.42- 144.37 (m, Ar). N=CH), 118.74 141.27 (m, Ar), 149.69 (s, CH-NO2). aObs: Observed; Pre: Predicted; Res: Research. The 3D-QSAR models described in this work show both good internal and external predictivity and provide important contribution to the field of designing novel antibacterial agents. From the 3D QSAR studies steric and electrostatic contour maps we can conclude that electronegative groups surrounding the bezodiazepine moiety are related to improved potency. In addition, the favorable steric contours suggest that aromatic bulky groups at the bezodiazepine moiety may increase ligand potency. The 3D QSAR models should be useful for the design of new structurally related potential antibacterial having improved affinity and potency. The authors are thankful to Dr. H. N. More, Principal, Bharati Vidyapeeth College of Pharmacy, Kolhapur for providing facilities to carry out the work.
. Biradar JS, Manjunath SY. Synthesis and pharma-cological activities of biheterocycles 7-substitutedphenyl- 5-(5'-substituted-2'phenylindol-3'yl)-1, 4- benzo[b]diazepines. Indian J Pharm Sci. 2004; 66: 177-3. Mogilaiah K, Sudhakar R. Synthesis of pyrazoline, pyrimidine and 1,5- benzodiazepines derivatives of 1,8-naphathyridine and evaluation of antibacterial activity. Indian J Chem 2003; 42 B: 636-0. Patak V, Joshi R,Gupta N. Synthesis and antimicrobial activity of S Alkyl/aryl-7-aryl/aryl azo 2,3 dihydro-1H 1,4 diazepines. Indian J Hetero Chem 2005; 14: 311-4. Babu H, Gupta A, Shrinivashan K, Pai K. Synthesis and biological evaluation of benzofuran incorporated benzodiazepines. Indian J Hetero Chem 2005; 14: 267-8. Raviraj A, Ghate M, Manohar V. Synthesis of spiro[indolo-1,5- benzodiazepine] from 3acetyl coumarins for use as possible antianxiety agents. J Chem Sci 2004; 116: 265-0. Kumar A, Sharma P, Gurram V, Rane N. Studies on synthesis and evaluation of quantitative structure–activity relationship of 10-methyl-6-oxo-5-arylazo-6, 7-dihydro-5H- [1,3] azaphospholo [1,5-d] [1,4] benzodiazepine -2-phospha - 3-ethoxycarbonyl-1-phosphorus dichlorides. Bioorg Med Chem Lett 2006; 16: 2484-1. Clark R, Carter K, Mullen A, Coxon G, Dapaah G, McFarlane E, Thi M, Grant M, Justice N, Tetteya A, Mackaya S. Identification of the ben-zodiazepines as a new class of antileishmanial agent. Bioorg Med Chem Lett 2007; 17: 624-7. Meerpoel L, Gestel J, Gerven F, Woestenborghs F, Marichal P, Sipido V, Terence G, Nash R, Corensa D, Richard R. Pyrrolo [1,2-a] [1,4] benzodiazepine: a novel class of non-azole anti-dermatophyte anti-fungal agents. Bioorg Med Chem Lett 2005; 15: 3453-8. Grossi G, Braccio M, Roma G, Ballabeni V, Tognolini M, Calcina F, Barocelli E. 1,5-Benzo-diazepines Part XIII. Substituted 4H-[1,2,4] triazolo [4,3-a] [1,5] benzodiazepin-5-amines and 4H-imidazo[1,2-a] [1,5] benzodiazepin-5-amines as analgesic, anti-inflammatory and/or antipyretic agents with low acute toxicity. Eur J Med Chem 2002; 37: 933-4. Bhatia M, Ingale K, Choudhari P, Bhatia N, Sawant R. Application quantum and physic-chemical molecular descriptors utilizing principal components to study mode of anticoagulant activity of pyridyl chromen-2-one derivatives. Bio Med Chem 2009; 17: 1654- 2.